ISLAMABAD: Foreign Affairs Minister Shah Mehmood Qureshi Thursday said that Pakistan wanted good neighborly ties with India but the strain in bilateral relations was natural until the Kashmir dispute was taken to its logical end. Addressing a seminar on Kashmir issue held at National Press Club, the foreign minister said the whole nation was united on Kashmir issue which was also a main component of Pakistan’s foreign policy. He thanked the Kashmiri leadership for lauding his address at the United Nations General Assembly’s recent session and told the audience that the meeting of the OIC Contact Group on Kashmir was also an impressive sitting. He particularly appreciated the foreign ministers of Turkey and Azerbaijan for categorically supporting the Kashmir cause in the meeting. Shah Mehmood Qureshi said neither there was any confusion in the stance of Kashmiri people nor it has any moral or legal loophole. He said the Indian stance on Kashmir was contrary to the basic concept of the division of the subcontinent which was based on including the Muslim majority population in Pakistan. The foreign minister hoped that the Kashmiris’ slogan of ‘Kashmir banay ga Pakistan’ (Kashmir will become Pakistan) would be realized. He said Kashmir was illegally annexed with India and highlighted the role of Kashmiri Maharaja in this regard. The international community must be made realize the sensitivity of the issue which had begotten three wars between the two nations. Nullifying the Indian stance of dubbing Kashmir issue as mere a propaganda, the foreign minister questioned as why India had deployed around 0.7 million troops in Occupied Kashmir and enforced special laws there instead of ruling the territory with normal laws. He asked Indian leadership about the rationale behind the amendment in Article 35A of the constitution if the Kashmiris’ stance carried no weight. All of these facts negated the Indian stance and promoted the cause of Kashmiri people, he added. The foreign minister also rejected the Indian stand on Occupied Kashmir citing Lord Mountbatton’s letter to Maharaja and Jawaharlal Nehru’s letter to Nawab Liaqat Ali Khan which clearly mentioned Kashmir as a dispute besides suggesting its resolution though plebiscite. He said Pakistan could never be oblivious to the Kashmir issue. “My blood does not allow me to give up this issue. My conscience does not allow me,” he remarked. The foreign minister also apreciated the role of former Jamat-e-Islami leader late Qazi Hussain Ahmed and said there was no differnece of opinion in Pakistan on Kashmir issue. He said the demand of the Kashmiri people was always considered right. He said though war was not a solution to this issue but even then it caused massive bloodshed. 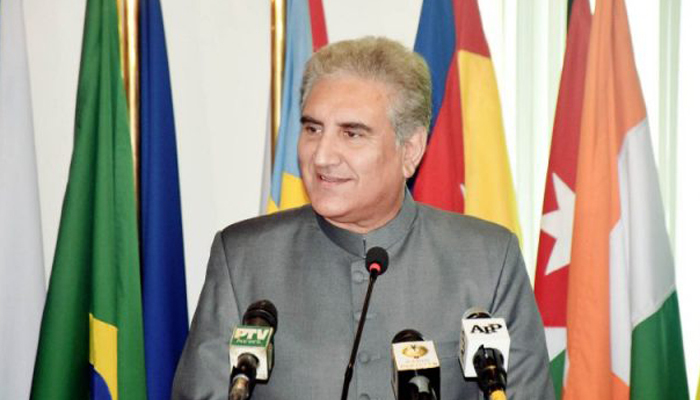 Qureshi said Kashmir was still on the agenda of the United Nations and the Kashmiri people had drew world’s attention to this issue by rendering immense sacrifices. He said Kashmir struggle was not now confined to Srinagar rather it was known across the world.